The Digitized Ramblings of an 8-Bit Animal: Alien Hominid Hit Consoles A Decade Ago, And Changed Everything. Alien Hominid Hit Consoles A Decade Ago, And Changed Everything. The early 2000s were a very cool time for the Internet. Sites that showcased flash based videos and games were really popular, and the most popular of those was Newgrounds. None of those has been as popular as a little homage to Contra and Metal Slug from a small team known as The Behemoth. When this game hit the site, it became wildly successful, so much so, that it was tapped as the team's first console release. That game was one of the most popular titles on Xbox Live Arcade for a time and is still one of the great gems released on the PS2 and GameCube. This game, Alien Hominid is still available in it's original form as a flash game, and after a decade, the console versions of the title hold up incredibly well to this day. For those unfamiliar with this title, players take control of a little yellow alien who is simply trying to find his shtp and leave home after being shot down by the FBI. The little guy is armed with a simple blaster that also has a charge shot much like Mega Man's eponymous Mega Buster. There are also a number of weapons powerups and vehicular weapons that pop up during the game. All of the weapons are par for the course with side scrolling action games, but that's the charm of Alien Hominid. It doesn't need to do anything new or innovative, but it does everything well. Boss fights are a throwback to the days of Contra: big bosses that fight in patterns and die in huge explosions. Graphically, it's a vibrant, colorful game in general. Not having voices doesn't distract from the characters in Alien Hominid bursting with personality. Even the little rats in a sewer stage are smarter than many main characters in big budget titles with a huge fanbase. Animation wise, it isn't particularly fluid, but it's definitely serviceable, and while parts of the soundtrack seem way too serious for the backdrop, it's pretty solid nonetheless. Apart from the core game, there are a few interesting minigames that proved pretty awesome. There is a pretty solid challenge mode with different parameters, and play options. Also, a host of "PDA Games" which was a series of single screen platform jumping levels with puzzle elements and a level editor. Finally, there was Super Soviet Missile Mastar, an Atari 2600 flavored scrolling "avoid the obstacles and hit the target" with a Soviet invasion of America theme. None of them are incredibly deep, but they are definitely fun distractions from the core game. Alien Hominid was born in 2002, hit consoles in 2004, and cemented The Behemoth as a pretty big deal among indy developers. They have grown to make some pretty amazing things happen and it all started with this game. Here's to celebrating the console release of one of gaming's most unlikely success story. 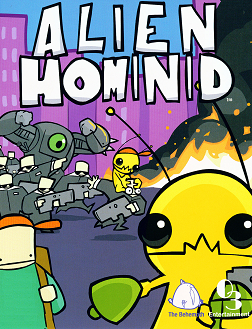 Oh man, Alien Hominid is a decade old?! That's crazy! My wife still has that game. Great post!